Titian (c. ?1485–90-1576) was a Venetian painter, draughtsman and printmaker and treated all manners of subjects from religious subjects to portraits and allegories and scenes from Classical mythology and history. His work marks the transition from the 15th-century tradition characterised by meticulous finish and the use of bright local colours to the 16th century interest in a broader technique, with less defined outlines and more congruous colouring. Although based in Venice, Titian received commissions for royal and noble patrons outside Venice and Italy, notably for Philip II of Spain and his works had a formative influence on major European painters of the 17th century, including Rubens and Velázquez. CAI.97 appears to be a 16th century copy of Titian's painting of ca. 1521-23 in the Kunsthistorisches Museum, Vienna of roughly the same dimensions. The Vienna picture is recorded as in the home of Zuan Antonio Venier in Venice in 1528 and in the collection of Bartolomeo della Nave in the same city by 1648, suggesting that the V&A copy was painted there around this time. 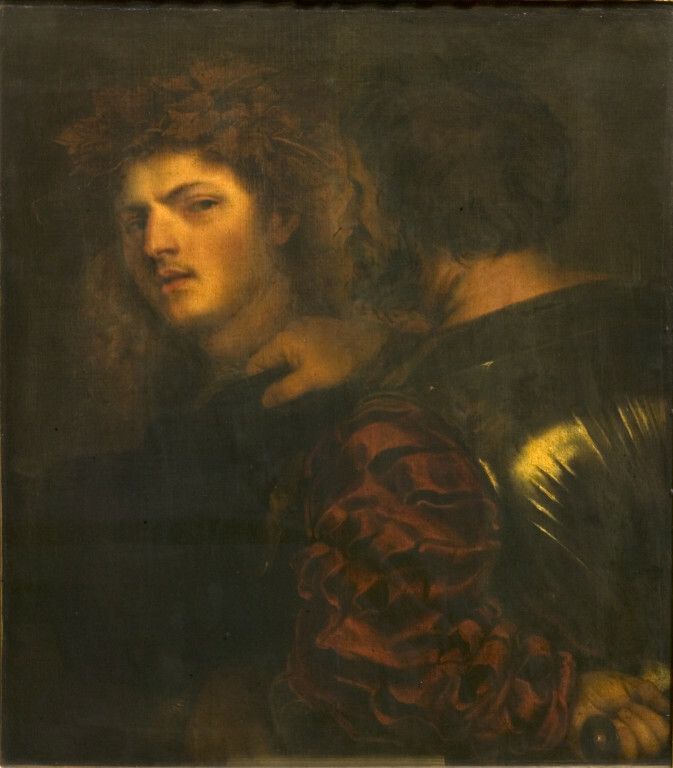 However, the V&A picture lacks the luminescent colouring, skilled handling of light and the same attention to detail visible in Titian's original. There are also some differences in the facial expression of the youth. The subject represented is still debated, with scholars divided as to whether it depicts an episode from Plutarch's Life of Marius in which Caius Lucius attacks Trebonius or a subject derived from Euripides' Bacchae and Ovid's Metamorphoses,: Bacchus' arrest by Pentheus, the king of Thebes, who opposed the spread of his cult. The identification of the scene with Bacchus is supported by the crown of vine leaves worn by the young man and his mane of blond hair, also visible in Titian's representation of the god in the Bacchus and Ariadne (London, National Gallery, NG35). Several other copies of the Vienna picture are known. Bequeathed by Constantine Alexander Ionides, 1900. The painting is not mentioned in Ionides' inventory of his collection (private collection), suggesting that it belonged to his father Alexander Constantine Ionides. The collection formed by Constantine Ionides includes works of a wide variety of schools, periods and artists. His collection includes Old Masters, 17th century works, contemporary British works and French 19th century works. Constantine formed friendships with artists of the day, especially Legros, who, having spent 17 years in Britain, became a naturalise British citizen. Constantine proved a stable and generous buyer of Legros work, while Legros, in turn, became an advisor in the matters of art to the attentive Constantine. Constantine’s plans concerning his collection conformed to a more ‘public-welfare’ vein of thought than his father or brother. He decided to donate his collection to the Victoria & Albert Museum, instead of privately distributing it or disposing of it in a Sales room. The collection bequeathed to the museum in 1901 comprises 1138 pictures, drawing and prints, to which a further 20 items were added on the death of his widow in 1920. The works are listed in the V&A catalogue of the Constantine Alexander Ionides collection. 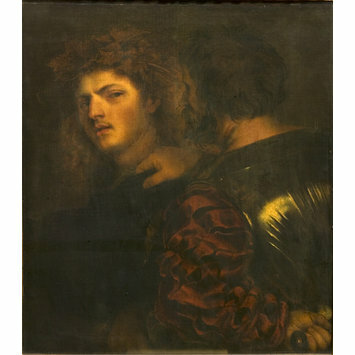 Historical significance: Titian [Tiziano Vecellio] (c. ?1485–90-1576) was a Venetian painter, draughtsman and printmaker and treated all manners of subjects from religious subjects to portraits and allegories and scenes from Classical mythology and history. His work marks the transition from the 15th-century tradition characterised by meticulous finish and the use of bright local colours to the 16th century interest in a broader technique, with less defined outlines and more congruous colouring. Although based in Venice, Titian received commissions for royal and noble patrons outside Venice and Italy, notably for Philip II of Spain and his works had a formative influence on major European painters of the 17th century, including Rubens and Velázquez. CAI.97 appears to be a 16th century copy of Titian's painting of ca. 1521-23 in the Kunsthistorisches Museum, Vienna (77 X 66.5 cm) of roughly the same dimensions. The Vienna picture is recorded as in the home of Zuan Antonio Venier in Venice in 1528 and in the collection of Bartolomeo della Nave in the same city by 1648, suggesting that the V&A copy was painted there around this time. However, the V&A picture lacks the luminescent colouring, skilled handling of light and the same attention to detail visible in Titian's original. There are also some differences in the facial expression of the youth. The subject represented is still debated, with scholars divided as to whether it depicts an episode from Plutarch's Life of Marius in which Caius Lucius attacks Trebonius or a subject derived from Euripides' Bacchae and Ovid's Metamorphoses,: Bacchus' arrest by Pentheus, the king of Thebes, who opposed the spread of his cult. The identification of the scene with Bacchus is supported by the crown of vine leaves worn by the young man and his mane of blond hair, also visible in Titian's representation of the god in the Bacchus and Ariadne (London, National Gallery, NG35). Several other copies of the Vienna picture are known including : (I) Vienna, Academy (destroyed); (2) Rome, Galleria Doria Pamphili, no. 483, by Pietro della Vecchia; (3) Venice, Accademia, no. 458; (4) copy by Varotari mentioned by Boschini, (5) Christie's, 24 Feb. 1933, lot 33, and Sotheby's, 22 March 1933, lot 93. History painting, i.e. depictions of non recurring events based on religious, classical, literary or allegorical sources, particularly developed in Italy during the Renaissance (15th-16th centuries). History painting could include religious themes, or depictions of momentous recent events, but the term was most frequently associated with Classical subject-matter. However a renewed impetus was given to religious subjects after the Council of Trent (1545-63), which stipulated new iconographical programmes. The development of art treatises, in which the compositional rules guiding the art of painting were discussed also notably, influenced the evolution of history painting. From around 1600 history painting’s principal rivals: still-life, landscape and genre painting began to emerge as independent collectable genres. Kauffmann, C.M. Catalogue of Foreign Paintings, I. Before 1800. London: Victoria and Albert Museum, 1973, pp. 274-275, cat. no. 341. J. A. Crowe and G. B. Cavalcaselle, A history of painting in North Italy, iii, ed. T. Borenius, London, John Murray, 1912, p. 34. K. Weinmayer, Cariani, München, 1912, p. 55. Basil S. Long, Catalogue of the Constantine Alexander Ionides collection.Vol. 1, Paintings in oil, tempera and water-colour, together with certain of the drawings. London : Printed under the authority of the Board of Education, 1925, p. 11. G. M. Richter, Giorgio da Castelfranco, called Giorgione Chicago, Ill., The University of Chicago Press, 1937, p. 250. Kunsthistorisches Museum, Wien, Katalog der Gemäldegalerie, i, 1960, p. 135. Filippo Pedrocco, Titian New York : Rizzoli, 2001, c2000, p. 12. Peter Humfrey, Titian : the complete paintings [Ghent, Belgium] : Ludion ; London : Distributed outside North America, Belgium, The Netherlands and Luxembourg by Thames & Hudson, c2007, p. 118, no. 69. CAI.97 is a close copy of a picture in the Vienna Kunsthistorisches Museum (inv. 207) now given to Titian but formerly attributed to Giorgione, Cariani, Dosso Dossi, Palma Vecchio, the 'Master of the self-portraits' and the 'Venetian School.' CAI.97 differs from the Vienna picture both in execution and in the facial expression of the youth. It was described as a replica by Tancred Borenius (1912) but is now generally accepted as a copy.